How does Bennett define need in the context of being a presidential candidate? Bennett defines need as having two possible meanings and says that needs can be split into two categories; first, what is absolutely essential for example being a natural born American citizen. The absolutely essential needs are usually constitutional requirements which mean that candidates do not stand any chance at all without meeting the requirements. The other type of need as defined by Bennett is very helpful which includes requirements that without a candidate will stand little chance of being elected although it is still technically possible. An example of this is the ability of being a good public speaker as this is a very important quality in an election candidate that many voters will look for however it is possible to receive votes without this quality. 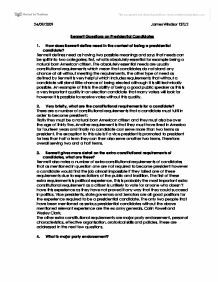 Very briefly, what are the constitutional requirements for a candidate? Firstly they must be a natural born American citizen and they must also be over the age of thirty five. Another requirement is that they must have lived in America for fourteen years and finally no candidate can serve more than two terms as president. The exception to this rule is if a vice president is promoted to president for less than half a term they can then also serve another two terms. Therefore overall serving two and a half terms. Bennett gives more detail on the extra-constitutional requirements of candidates, what are these? 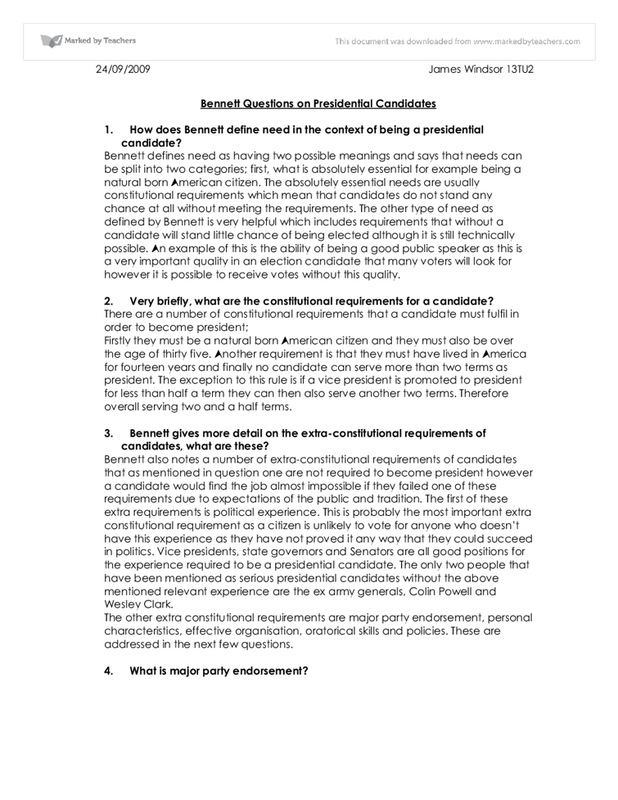 Bennett also notes a number of extra-constitutional requirements of candidates that as mentioned in question one are not required to become president however a candidate would find the job almost impossible if they failed one of these requirements due to expectations of the public and tradition. The first of these extra requirements is political experience. This is probably the most important extra constitutional requirement as a citizen is unlikely to vote for anyone who doesn’t have this experience as they have not proved it any way that they could succeed in politics. Vice presidents, state governors and Senators are all good positions for the experience required to be a presidential candidate. The only two people that have been mentioned as serious presidential candidates without the above mentioned relevant experience are the ex army generals, Colin Powell and Wesley Clark. The other extra constitutional requirements are major party endorsement, personal characteristics, effective organisation, oratorical skills and policies. These are addressed in the next few questions. What is major party endorsement? Major party endorsement is another important part of being considered a serious presidential candidate as a candidate must be part of one of the two major parties (Republican or Democrat). There are a small number of candidates that have run as third party candidates in the past and none have been successful. What points does Bennett make about personal characteristics and how have these been challenged during the 2008 campaign? Bennett makes a number of points about personal characteristics of past presidents however a few of these have been challenged in recent times. Most noticeably he says that all presidential candidates for main parties have been white males. However in 2008 the Democrat presidential candidate and current president Barrack Obama became the first afro American presidential candidate. It is also an important characteristic for a candidate to be married as there has not been an unmarried president since the nineteenth century. Finally it is important for the potential candidate to have avoided any scandals and/or marital infidelity as this has been known to rule out candidates in the past. Raising money is crucial to success in the race to become president. Campaigns cost huge amounts of money and only billionaire candidates can afford to finance their own campaigns. Overall the 2008 presidential election cost $1,600,000,000. What point does Bennett make on effective organisation? When running to become a party presidential candidate a party cannot for obvious reasons endorse one particular candidate and therefore a candidate cannot use that party’s organizational structure and therefore they have to create their own. Bennett comments that creating their own organizational structure is a time consuming, expensive and demanding activity but also one that is very important as many candidates that have had poor organizational structures have gone on to lose in either the party presidential candidate election or the general election. Bennett refers to speaking skills and being telegenic – How do Obama and McCain score here? Bennett comments that how a presidential candidate looks and their public speaking ability are very important to doing well in the election. Firstly looking at Obama most people would agree that he is a good public speaker and is also looks good and professional on TV. McCain’s style is slightly different to that of Obama and he has a different overall appeal as he also has good speaking skills he also drew a lot on his war experiences which gained him a large amount of respect with the American public. It would probably be fair to say that Obama was seen as more “In touch” and overall telegenic than his older opposition McCain. Despite all the other factors in becoming a successful candidate. As important as style is, the presidential elections are not a matter of style over substance and any candidate without a set of practical relevant policies will be seen right through by voters. Many candidates take the approach of majoring on one particular policy or topic for example in 2004 Howard Dean focussed on the War in Iraq as his major policy. This student written piece of work is one of many that can be found in our AS and A Level United States section.